First I’ll have a look at my beloved St. Brevin-les-pins where I’ve been already some times starting my cycling trips. The first impressions of the coast and what I’m looking forward – the best bread and ice cream I’ve had on my 19.000 km I’ve been cycling now… The old harbour of Pornic. Up now we’ve got the famous beach of Le Sables-d’Olonne where there is a nice camping at the end of the town. A highlight of this area is of course La Rochelle with it’s old harbour and Marine Museum. Here I’d like to stay the second rest-day, if possible with Couchsurfing or Warmshowers friends. Going on travelling along the EuroVelo 1 down the south here comes Rochefort and after the outstanding beach Andrew described on his blog cyclingeurope.org I’ll reach the ferry in Royan to follow an old pilgrims route, the EuroVelo 3 wich comes from Tours crossing the country. 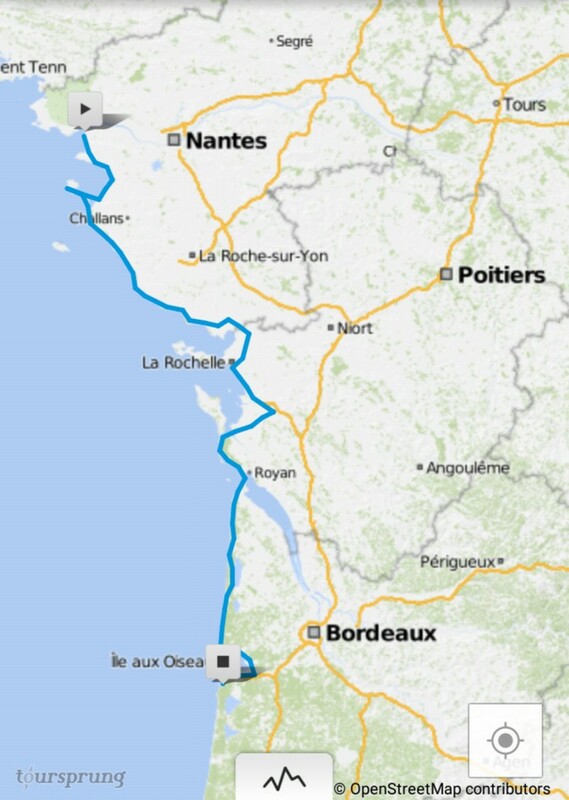 Next Highlight after about 200 km will be the Bassin of Arcachon with it’s famous (but for an vegetarian uninteresting) seafood and shells.